I’ve played the third and final game of this series. The order of play went: English, Pirates, Americans, French. The big difference between this game and the previous two was that instead of having the islands placed 2L apart from each other, they would be just 1L apart from each other! Also, no terrain was used. 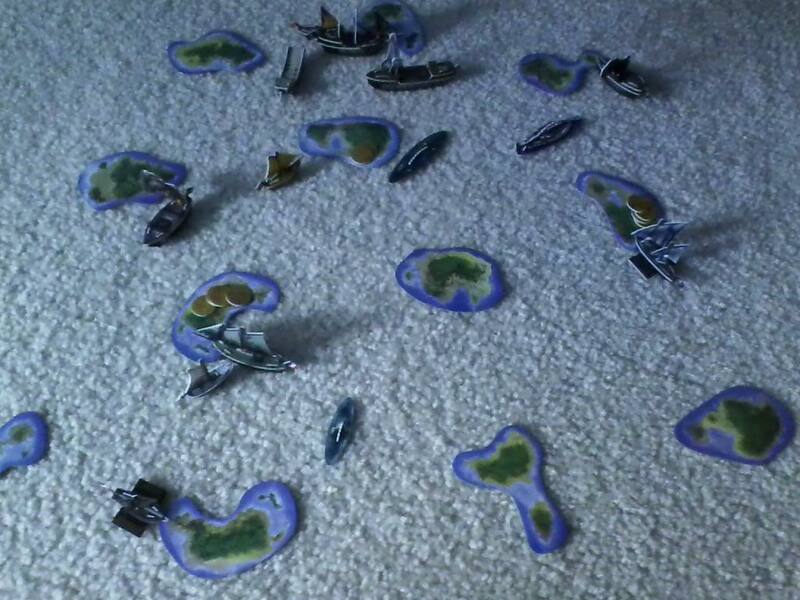 This shows the fleets at their home islands at the start of the game. Clockwise from upper left: Americans, Pirates, English, French. The short distances between islands made for a smaller gaming area (a good thing if you need to play on a table) as well as a good game. 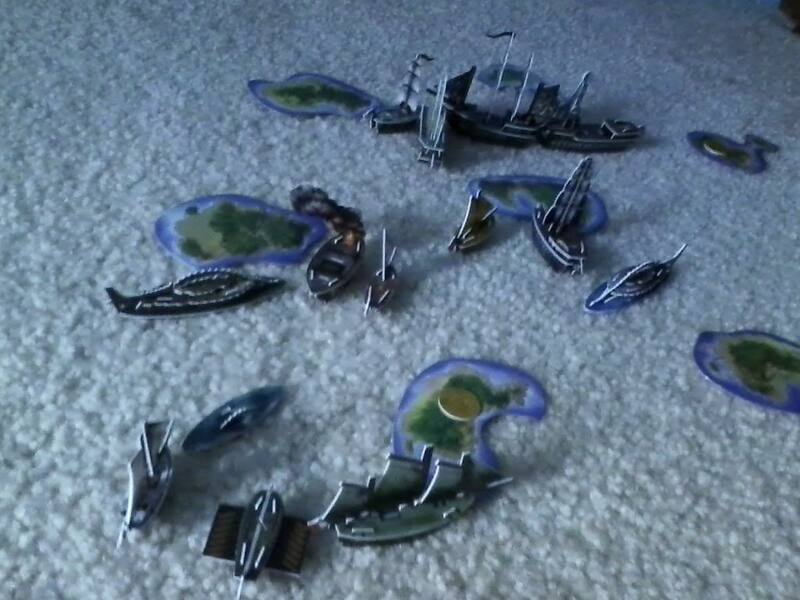 The treasure ships for each fleet were immediately able to grab gold, with the islands being so close together. The Queen Anne’s Revenge sank the Patagonia and the 5 gold she was carrying. The Baionnette set the Royal Rover on fire. 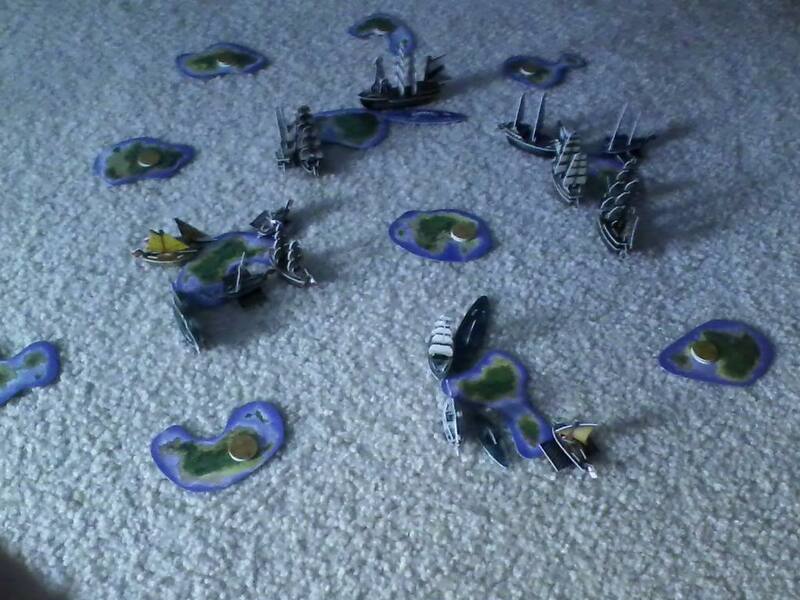 The rest of the English fleet headed towards the French, aggressively sailing their four dangerous ships into action. They sunk the Belle Poule and dismasted the Tunis. The Pirates sent Blackbeard (on the Royal Rover) after the Paladin and her 9 point crew, Peregrine Stern. Getting revenge on the French, the Obago now dismasted the Baionnette, and the Queen Anne’s Revenge sunk her. The Paladin dismasted the Royal Rover before she could attempt to board the American three master, as the Nene Nui came home with three coins for the Americans. The SCS Santa Lucia captured the Royal Rover and set the Paladin on fire. The Triton brought home a coin for the French. The English were trying a strategy different from the previous two games: concentrate on one opponent rather than dividing forces. They went after the French to begin with, but it quickly fell apart from there. The Algiers got greedy and took off when she rolled for an extra action. On her way up north to attack the Frontier, she dismasted the Paladin as she traveled almost the entire length of the sea with her double move-and-shoot. Her attack on the Frontier was a complete success: both the guns and ram attempt worked, and not only was the Frontier derelict, but the boarding party even eliminated her helmsman! Unfortunately for the English, the rest of the English fleet was too slow to support the efforts of the Algiers, so she was stuck on her own, which wouldn’t work out well since the Frontier had 6 treasure coins on her from the two islands she explored, making her the biggest target in the game. However, the rest of the English fleet were able to continue their concentrated assault. The Locker surfaced and sank the captured Royal Rover before the French could tow her home. The Pyre rammed a mast off the SCS Santa Lucia, but the Lord Cauldwell predictably missed the Tunis both times in an effort to sink her. The Queen Anne’s Revenge now stole a coin from the American HI, while also dismasting her fellow Spanish HI-raider in the OE Santa Lucia. Just to the north, the Obago captured the Frontier, giving the Pirates a huge prize if only they could tow her back to their home island. The Nene Nui rammed the Algiers, taking out a mast and her oarsman. The Mercury finally surfaced, taking two masts off the Queen Anne’s Revenge. To the south, the Tunis brought in gold for the French, while the Triton sailed to an untouched wild island just south of the French HI. The Pyre and Lord Cauldwell pursued the Triton, with the Lord Cauldwell eventually connecting to take out the mizzenmast of the Triton. The Locker submerged and headed east. To the north, the main conflict grew hotter. 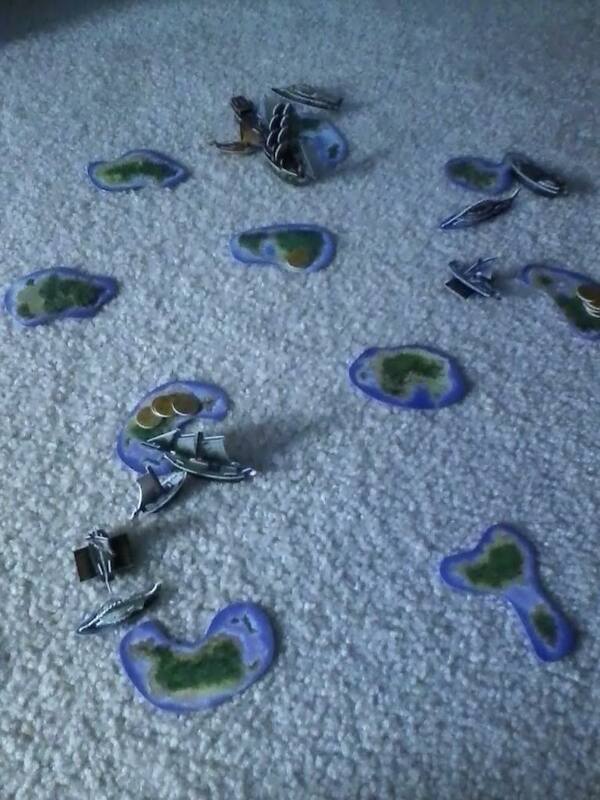 The Algiers missed her shot to sink the Frontier, and the Obago dismasted her on the following turn. The Obago, looking to clear the sea of obstacles before she could tow the Frontier home (it was such close quarters that the Obago almost couldn’t maneuver), also shot off two masts on the Nene Nui. The Nene Nui rammed the Obago in an attempt to kill her Pirate helmsman, but failed. The Queen Anne’s Revenge brought back the coin she stole from the Americans, a rare example of a successful home island raid! The Tunis repaired as the Triton brought back another coin for the French. The Pyre and Lord Cauldwell both failed in their ram attempts to damage the Triton. The SCS Santa Lucia dismasted the Nene Nui, leaving the Americans with just the Mercury and therefore no way to acquire more gold (subs can’t tow). For the Pirates, the Swift had brought back three coins during two different gold runs. The Queen Anne’s Revenge (with one mast remaining) grabbed a coin to empty an island near the Pirates’ HI. The Mercury, still mad about having her home island robbed, proceeded to set the Revenge on fire as she was dismasted. The Locker tried to sink the Frontier, but missed. The Obago sank the Algiers, finally giving her a clear path to re-orient herself in the right direction to start towing the Frontier home. The SCS Santa Lucia took a mast off the Obago, but the Obago was still in good shape with 3 masts left. In the south, the Triton was blasting away at the Lord Cauldwell as the Tunis grabbed the last two gold coins in play from a southern island. The Pyre surfaced and shot at the Tunis, leaving her to depend on oars once again. 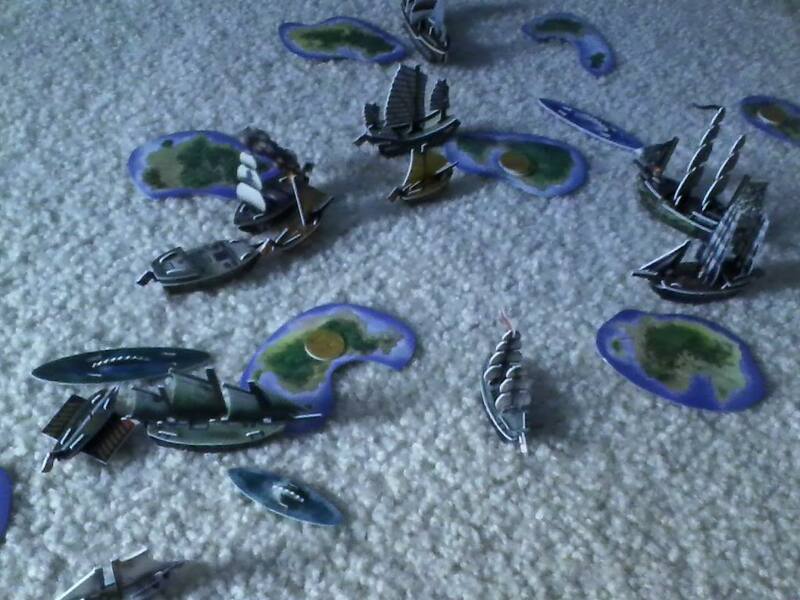 The Obago started towing the Frontier, and sunk the Nene Nui for good measure. The Frontier was moved to a new position when the Obago towed her, placing her out of range of the Mercury, who didn’t want to see the formerly American gold docked at an enemy home island. However, the Locker was a bit closer. She went around an island and had two guns in range of the derelict Frontier. The first one missed, but the second one connected, forcing 13 gold to the bottom of the sea! The Swift managed to transfer the gold from the Queen Anne’s Revenge, but the Mercury sunk the Swift before she could dock it. In the south, the game was coming to its conclusion just as the northern events were transpiring. The Pyre missed the Tunis twice, letting the galley dock home the last 2 coins and thus end the game! The game would have ended in a 10-10 tie if the Swift had returned with the 2 aboard the Queen Anne’s Revenge and the Pyre had sunk the Tunis and the 2 gold that she was carrying. With their second victory in this multiplayer series, the French have officially won! Their 80 point fleet seems to be the best of the four, winning even in the face of tough odds, as the English dogged them all game long. Their 40 and 60 point versions were soundly beat by the English, so I would say the best 40 point fleet would have to be the Americans, with either the Pirates or English having the best 60 point fleet. For this 3 game series, the French win two games, the Americans one, and the English and Pirates zero apiece. I’m looking forward to recreating the Moonlight Battle on Thursday night! Therefore the pics probably won’t be posted on MT until late. Thanks for reading!